Store signs are important whether they are installed inside or outside of the business. 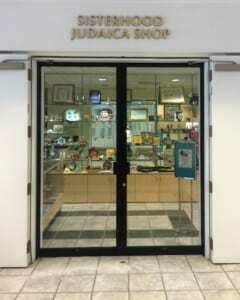 We have made many storefront signs like channel letters for businesses, and this time we were asked to make a sign for a gift shop inside of a synagogue. Shomrei Torah Synagogue is located in West Hills, California, and we have been making signs for them almost as long as we’ve been around. 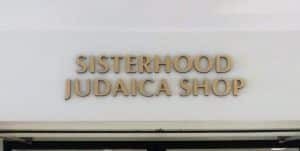 They’ve had a gift shop which was named the Judaica Shop and they recently decided to rename it the Sisterhood Judaica Shop. To start the job we visited the location to get a few photos of the existing sign that just read “JUDAICA SHOP” to match the color for the new sign. They wanted the same font and color as the existing sign, but new letters. If you read our blog about dimensional letter signs, you know that there are quite a few options for materials and endless options for colors. To get the color they wanted we started with bronze acrylic. Acrylic comes in many colors and sometimes it’s available in the exact color we’re looking for. If you have a very specific logo color, we can also paint your acrylic letters. This sign was to be mounted above a doorway with double doors so it was going to be pretty big. This is why we decided to use 1/2″ thick bronze acrylic. It’s important to keep in mind the size of the letters when choosing your material thickness. If the letters are larger, you need to use thicker material if you want to get that dimensional look. On the other hand, if you use material that is too thick for smaller letters, they can end up looking chunky. 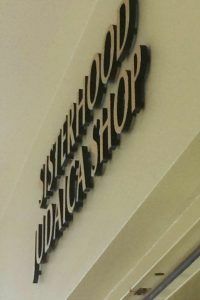 To match the color of the old sign, we laminated the bronze acrylic with brushed brass laminate before routing out the letters. The darker color of the bronze acrylic with the brass faces creates a nice shadow effect. For some dimensional letter signs, we will mount the letters using spacers so they float off of the wall creating more dimension. With this sign, we mounted the letters flush due to the thickness of the material. Whether you have an existing sign that you need to match, or you want to design a completely new sign, we can help you achieve the color and style that you feel matches your business. Feel free to check out our website to see the many different types of dimensional letter signs we’ve made.